Project Rose – painting, plus sorting the oak doors mean I get high! Most certainly there are more exciting ways to get high on a Friday night than sniffing paint fumes and white spirit, but sadly it was the best and only thing on offer for me last night. It’s now a mad rush to get the kitchen, decorating and joinery finished at Rose Cottage for Hannah to move in this week, and no-one ever really understands the annoyingly specific order of things unless they’ve done it themselves. For example, couldn’t eggshell the upstairs skirts and door frames during the day as there was too much dust in the air from the miscellaneous building works, so had to wait til evening to paint the upstairs skirtings; which were then sticky so no sweeping up or floors top-sanding ready for staining allowed; once the floors had been stained they couldn’t be walked on so no wall touching up allowed; then varnishing (2 coats!) so another wait…. and clients wonder why everything takes so long! 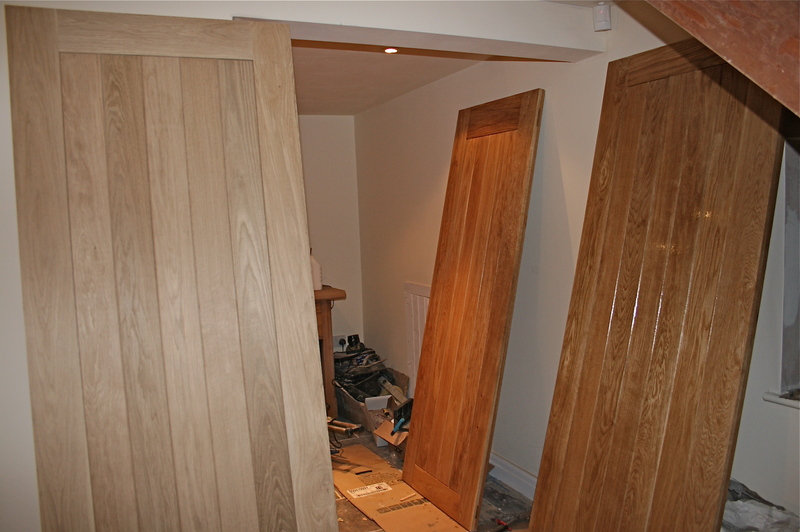 The bedroom and bathroom doors arrived from UK Oak Doors and are just magnificent, so solid and traditional looking, quite the nicest doors I have ever ordered. They’re a frame and ledge door, Suffolk Style, and feel about a zillion times more sturdy than the frame and ledge ones on offer in local diy stores. 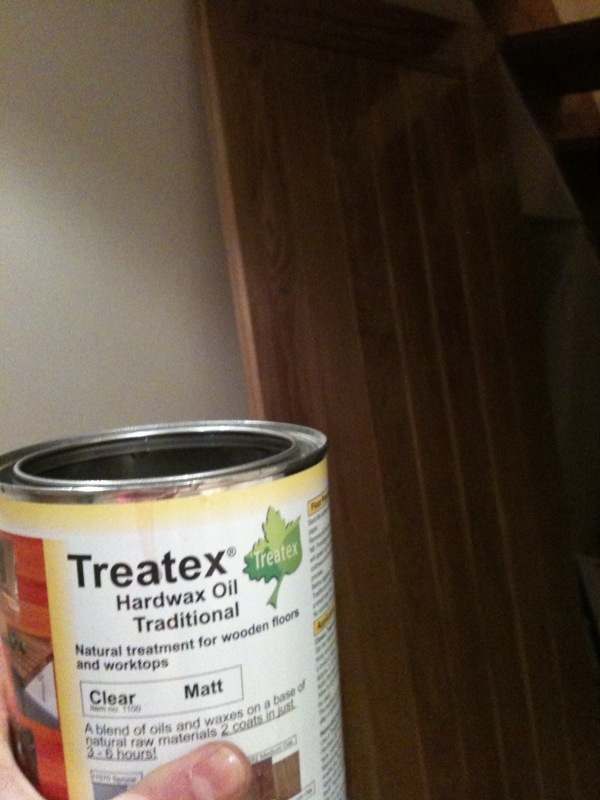 As they’re solid oak doors, they’ve to be treated once on site and a pot of the recommended Treatex Hardwax oil – made using natural sustainable raw materials – was enclosed. Together with the eggshell drying and slate seal upstairs, the combined fumes nearly knocked me off my feet but it was way too21 cold at 9pm to open up the door and windows, so I just got high, determined to get the first coat on all the doors before the joiner man-handled them the next morning. You can see from the image above the difference in depth of colour just one coat of the oil made – it enhanced the grain of the oak beautifully. Took me two hours to do the three doors, front and back, before my back said enough, my stomach demanded food and my brain imploded. Today, Magic’s been busy fitting them; it’s 5pm now, I’m just about to head up there and take a look at the finished and hung doors, suffolk latches and all. Design – A ‘vintage’ look Gorenje fridge for Rose, fingers crossed! Sorry Jim, your comment slipped by without me answering! I’ll be posting some images of Rose Cottage soon as the finishing touches are to be done this coming week, suffice to say the doors are just gorgeous, great quality and the client loves them. 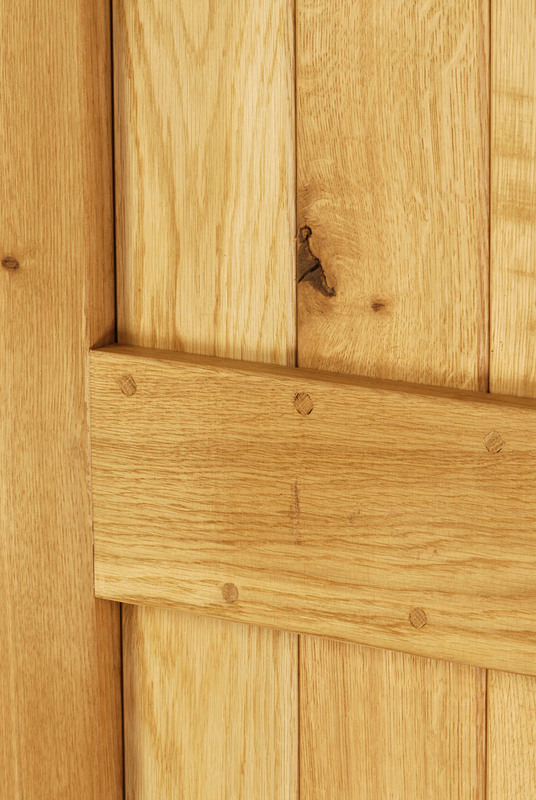 Thinking about oak doors from this company, are you still as happy with them? Yes, delighted. 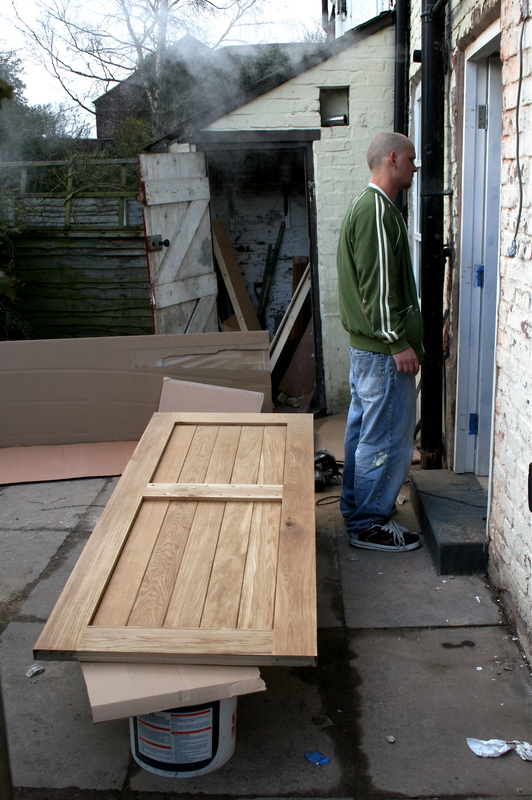 Very little movement etc to any of the hung doors apart from some slight sanding required to the bathroom door. This is more to do with the size of the bathroom and moisture content of the property than the door!